This article is about the female wrestler. For the previous wrestler known as Awesome Kong, see Colossal Kongs. "Kharma" redirects here. For the concept, see Karma. Kia Michelle Stevens (born September 4, 1977) is an American professional wrestler and actress best known for her time with Total Nonstop Action Wrestling under the ring name Awesome Kong in the US, and Amazing Kong in Japan. 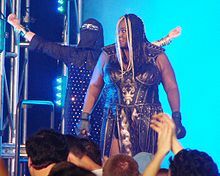 She also appeared in WWE as Kharma. She is a five-time Women's Champion, having won the TNA Knockouts Championship two times and the WWWA World Single Championship, NWA World Women's Championship, and AWA Superstars of Wrestling World Women's Championship once. Her success is not limited to singles wrestling, as she frequently teamed with Aja Kong to form the tag team W Kong who held tag team championships in four different promotions, along with winning the TNA Knockouts Tag Team Championship with Hamada. She was also ranked first in the inaugural list of Pro Wrestling Illustrated's Top 50 Females and is the third woman to enter the WWE Royal Rumble match. As an actress, she is best known for playing Tammé "The Welfare Queen" Dawson in the Netflix original comedy series GLOW. She began her professional wrestling career in 2002 after appearing on a reality television show. She primarily wrestled in Japan for the first five years of her career, holding numerous championships there. In 2006, she began wrestling in her native United States again, appearing on the independent circuit before appearing on national television with TNA Wrestling where she was a driving force in the foundation of their Knockouts division. Amy Dumas, known during her WWF career as Lita, and Trish Stratus served as Stevens' primary inspirations to become a professional wrestler. In 2002, Stevens appeared on the Discovery Health Body Challenge as a contestant trying to lose weight in hopes of becoming a professional wrestler. Afterward, Stevens trained at the School of Hard Knocks out of San Bernardino, California. Soon, she was able to have her first professional match in the Empire Wrestling Federation. After putting on an impressive showing at a tryout, Stevens was invited to further her training in the dojo of joshi puroresu (female Japanese wrestling) promotion All Japan Women's Pro-Wrestling (AJW). While there she underwent a rigorous training schedule, became fluent in Japanese, and engaged in training for mixed martial arts but chose to pursue professional wrestling. She was given the ring name Amazing Kong by Masatsugu Matsunaga, who needed a replacement for Japanese female wrestler Aja Kong in several matches. Stevens, as Kong, worked for multiple women's promotions in Japan, and she defeated Ayako Hamada for the WWWA World Single Championship in late 2004. Later, Stevens cited Hamada as one of her favorite opponents. In 2004 Kong debuted for the joshi promotion Gaea Japan in a match against Aja Kong. At the promotion's ninth anniversary event Aja Kong won the match but gained enough respect for Amazing Kong that the two attacked both competitors in the main event, revealing themselves as a new tag team named W Kong. The duo soon made their presence felt when they challenged Chigusa Nagayo and Lioness Asuka for the AAAW Tag Team Championship on May 5 and won. The team defended the championship successfully all Summer, eventually losing to Manami Toyota and Carlos Amano on September 20. Going into 2005, Kong main evented the final Gaea show before the promotion closed down. In the final match of Fifth Anniversary, Kong teamed with Ayako Hamada and Mayumi Ozaki in a winning effort against Akino, Dynamite Kansai and Gami with Ayako picking up the victory. After the closure of Gaea, W Kong went on to wrestle for a number of Japanese promotions including Hustle, where they were given the comedic gimmicks of Margaret and Erika which involved, among other things, wrestling in a yellow tutu. They won the predominantly male Hustle Super Tag Team Championship from June until October 2006. They were also the final team to hold WWWA World Tag Team Championship before AJW shut down. In early 2007, Kong also won the AWA Superstars of Wrestling World Women's Championship in Tokyo, Japan and held it from January to May. She lost it to Nanae Takahashi in a three-way match, which also included Wesna. Stevens debuted on the October 11, 2007 episode of Total Nonstop Action Wrestling (TNA)'s flagship show Impact! under her original name "Amazing Kong" which would be later tweaked to "Awesome Kong" as part of TNA's attempt to bolster their Knockout division. After defeating Gail Kim, Kong participated appeared at the Bound for Glory PPV. There she took part in a 10-Knockout Gauntlet match to crown the first TNA Women's Knockout Champion but she was eliminated by the combined effort of Angelina Love, ODB and eventual winner Gail Kim. Two months later at Turning Point, she lost a Women's Knockout Championship match to Kim via disqualification after shoving the referee and Awesome Bombing him. This incident led to a No Disqualification match for the Women's Knockout Championship at Final Resolution in January 2008, which Kong also lost. On the next episode of Impact!, airing 10 January, Kong debuted an anonymous manager wearing a niqāb, later named Raisha Saeed; with her help Kong finally won the Women's Knockout Championship. At Lockdown, Kong and Saeed teamed up for the first time, losing a Tag Team Cage match to Kim and ODB. In August 2009 Kong and Saeed entered the tournament to crown the inaugural TNA Knockouts Tag Team Champions. In the first round of the tournament, the team was able to defeat The Main Event Mafia (Traci Brooks and Sharmell) after Saeed blind tagged Kong and pinned Brooks, much to Kong's dismay. Three weeks later they were eliminated from the tournament by their long term rival Taylor Wilde and her partner Sarita when Wilde pinned Saeed. Subsequently, Kong began rivalries with Tara and Knockout Champion ODB. At Bound for Glory, Kong had her last match for the Knockout Championship against Tara and ODB, but Saeed inadvertently cost Kong the match while interfering. On the following episode of Impact! Kong faced Saeed in a grudge match and powerbombed her through the entrance stage, signalling the end of both their partnership and the Saeed character. After interfering in two of Tara's matches, Kong and Tara wrestled at Turning Point in a Cage match, which Tara won. In March 2013, Stevens turned down an offer to take part in a special all Knockouts pay-per-view held by TNA. On December 29, 2010, it was reported that Stevens had signed a contract with WWE. From April 11, 2011 onwards, vignettes aired during WWE television with Stevens, whose face was concealed by shadows and her signature braids, dismembering female dolls while cackling maniacally. During the April 25 episode of Raw, Stevens' face was shown for the first time in the vignettes, and her new ring name was revealed as Kharma. Kharma made her debut on May 1 at Extreme Rules, attacking Michelle McCool after a match, and she continued to attack former WWE Divas Champions on both Raw and SmackDown in the following weeks. On the May 23 episode of Raw, Kharma interrupted a tag team match but rather than attack everyone, she uncharacteristically broke down crying. The following week, Kharma spoke for the first time to reveal she was pregnant and thus forced to take a leave of absence from WWE. During her absence, she was included as a downloadable playable character in the WWE '12 video game. Kharma made a surprise return in the 2012 Royal Rumble match as the twenty-first entrant. She intimidated Michael Cole into eliminating himself before eliminating Hunico only to be thrown out by Dolph Ziggler. With her entrance, she became the third female, after Chyna and Beth Phoenix, to participate in a Royal Rumble match. This also marked her first and only official WWE match. In July 2012, Stevens confirmed via Twitter that she had parted ways with WWE, after being released from her contract. By August 19, she had been added to the list of the playable characters on the main roster in the WWE '13 video game. In September 2013, Stevens revealed that she was granted her release from WWE because she was not ready to return in the time they allotted for her. She also confirmed her interest in returning to the company, stating she was ready. In early November, it was reported that Stevens (again under the "Amazing Kong" gimmick) would be appearing at a Shine event on November 16, 2012 as the mystery partner of Jazz in a tag team match against Mercedes Martinez and Rain. At the event, Kong and Jazz defeated Martinez and Rain after Kong pinned Rain. On January 18, 2013, Kong defeated D'Arcy Dixon, Nikki St. John and Thunderkitty in a four-way match to win the vacant Resistance Pro Wrestling Women's Championship. On March 8, Kong returned to Chikara, losing to Eddie Kingston in an intergender main event. Stevens has also wrestled for PWS Bombshells (as Amazing Kong) in early to mid-2013, defeating Amy Lee in consecutive matches. On August 26, 2015, Kong returned to Japan to work the first ever event of Nanae Takahashi's new Seadlinnng promotion, which saw her and Meiko Satomura lose to Takahashi and Ayako Hamada in a main event tag team match. At the end of the show, Kong reformed the W Kong tag team with Aja Kong. Stevens was supposed to return to take part in Seadlinnng's November 25 event, but on November 22 Takahashi announced that she had pulled out of the match due to "poor health" and claimed she had decided to retire from professional wrestling. Stevens later stated that she had wrestled her final match in Japan and retired the Amazing Kong name, but was for the time being still working as Awesome Kong. Despite her previous announcement that she had wrestled her final match in Japan, Stevens, again working under the name Amazing Kong, returned to the country on July 18, 2016, to work Aja Kong's 30th anniversary event, promoted by Oz Academy. In the main event of the show, Kong teamed with Aja Kong and Ayako Hamada to defeat Chihiro Hashimoto, Hiroyo Matsumoto and Rina Yamashita. On January 7, 2015 during Impact Wrestling's debut on Destination America, Awesome Kong returned after a battle royal, had an altercation in the ring with Havok and attacked referee Brian Stiffler. Over the following weeks, tension would build between Kong and Havok, with their feud culminating in a steel cage match on the Lockdown edition of Impact Wrestling on February 6, which Kong won. On the March 6 episode of Impact Wrestling, Kong failed to capture the TNA Knockouts Championship in her match against Taryn Terrell after she got herself disqualified. She received a no disqualification rematch against Terrell on the TKO: Night of Knockouts edition of Impact Wrestling on April 24, which she lost after The Dollhouse (Marti Bell and Jade) attacked Kong. On the May 1 episode of Impact Wrestling, Kong turned face and allied herself with Gail Kim to feud with The Dollhouse. The following week, Kong and Kim were defeated by The Dollhouse in a 3–on–2 handicap match. On the June 17 episode of Impact Wrestling, Kong teamed up with Brooke to defeat The Dollhouse in a "Double or Nothing" tag team match, meaning that Kong and Brooke will face Taryn Terrell for the TNA Knockouts Championship in a three-way match. At Slammiversary XIII, Kong once again teamed with Brooke to defeat The Dollhouse in a 3-on-2 handicap match. Kong and Brooke received their three-way championship match on the July 1 episode of Impact Wrestling, in which Terrell retained the title. In mid–August, Kong, representing TNA, started a brief feud with Lei'D Tapa, who represented Jeff Jarrett's Global Force Wrestling. The two faced off on August 12 in a match, that ended in a double count-out. On the September 16 episode of Impact Wrestling, Kong competed in a fatal–four-way match against Brooke, Gail Kim and Tapa for the TNA Women's Knockout Championship, which Kim would win. At Bound for Glory, Kong received a match against Kim for but was unsuccessful in regaining the championship. During October and November (taped in July), she participated in the TNA World Title Series, where she ended first of her block, tied with Gail Kim, advancing to the finals where she lost to Jessie Godderz. On January 5, 2016, during Impact Wrestling's debut on Pop, Kong allied with The Dollhouse (Jade, Marti Bell and Rebel) and became their new leader after she attacked The Beautiful People (Madison Rayne and Velvet Sky) and Gail Kim, once again turning heel in the process. On February 5, TNA announced that Stevens had been released from her contract following a backstage real-life physical altercation with Rebecca (Reby) Hardy just a week before TNA's tour in the United Kingdom. Kong returned for one night only at Bound for Glory along with Taryn Terrell, Christy Hemme and Dixie Carter to induct Gail Kim into the TNA Hall of Fame. Stevens is a playable character as Kharma in WWE '12 and WWE '13. Stevens plays Tammé "The Welfare Queen" Dawson in the Netflix original comedy series GLOW from producer Jenji Kohan (creator of Orange Is the New Black), which was inspired by the 1980s female professional wrestling league Gorgeous Ladies of Wrestling. Stevens also made an appearance in Katy Perry's "Swish Swish" music video. Stevens grew up in Carson, California. Her mother, Phyllis Durant, was an actress and contestant coordinator for Family Feud. She has a younger brother. Prior to becoming a professional wrestler, she was a social worker and owned a business which put vending machines in high schools. Stevens' family and friends helped her fund her career in wrestling when she went to train in Japan. She is also an investor in Nu Skin Enterprises, a line of skin and nutritional products. On May 30, 2011, Stevens announced that she was pregnant with her first child. Two days after she competed in the 2012 Royal Rumble, a TMZ article claimed sources close to her informed them that she had given birth to a baby boy named Jamie on December 31, 2011. This alleged claim from close sources was rephrased as fact within an hour by Pro Wrestling Torch. In March 2012, Stevens revealed that she in fact did not give birth to a child the year prior but had actually suffered a miscarriage. On August 6, 2012, weeks after she confirmed her WWE release, Stevens stated that she was on a mission to lose weight. She recruited a team of fitness experts and a therapist so she could get back into wrestling shape. She also showed interest into turning the experience into a reality show. Recent[when?] photos have revealed a much slimmer Stevens. ^ a b c d e f g h i j "Profile on Online World of Wrestling". Online World of Wrestling. Retrieved 17 August 2007. ^ a b c d e Oliver, Greg (3 May 2010). "Awesome Kong believes in herself". SLAM! Wrestling. Retrieved 3 May 2010. ^ Martin, Adam (18 April 2011). "Report: The name Awesome Kong will use in WWE". WrestleView. Archived from the original on 27 April 2011. Retrieved 19 April 2011. ^ a b Caldwell, James (25 April 2011). "Caldwell's WWE Raw results live Raw - 2011 WWE Draft, Extreme Rules PPV hype". Pro Wrestling Torch. Retrieved 26 April 2011. ^ "Amazing Kong". The Internet Wrestling Database. Retrieved 31 May 2016. ^ a b "WWE profile". WWE. Retrieved 4 May 2011. ^ a b c "Shimmer Roster". Shimmer Women Athletes. Archived from the original on 2009-08-14. Retrieved 11 November 2009. ^ a b c d e f g h i j k l m n o p q r s t u Oliver, Greg (12 October 2009). "Awesome Kong". SLAM! Wrestling. Retrieved 3 January 2010. ^ "Episode 825 - Kia Stevens / Chavo Guerrero Jr". WTF with Marc Maron (Podcast). 3 July 2017. ^ Hatchett, Keisha (26 June 2017). "GLOW: Kia Stevens Explains Why Her Welfare Queen Gimmick Hit Close to Home". TV Guide. Retrieved 18 July 2017. ^ a b Champagne, Christine. "Television Reviews for Discovery Health Body Challenge". Out.com. Archived from the original on May 10, 2005. Retrieved 2008-04-30. ^ a b c d e "Interview Highlights: TNA's Amazing Kong says she doesn't hear crowd in matches, fan of Austin and Rock". PWTorch. 3 December 2007. Retrieved 9 January 2011. ^ a b "About Me". AwesomeKong.com. Archived from the original on 2010-01-05. Retrieved 2010-01-05. ^ "Limit Break April 30th Yoyogi gym". Gaea Japan. Archived from the original on 14 July 2014. Retrieved 9 January 2011. ^ "Junction May 5th Korakuen Hall". Gaea Japan. Archived from the original on 11 July 2011. Retrieved 9 January 2011. ^ "New Energy = September 20, 2004". Gaea Japan. Archived from the original on 11 July 2011. Retrieved 9 January 2011. ^ "GAEA 10th anniversary Yokohama Final Impact April 3rd . Yokohama Bunka Gym". Gaea Japan. Archived from the original on 11 July 2011. Retrieved 9 January 2011. ^ a b 2006年6月17日 ハッスル・エイド 2006 (in Japanese). Hustle. Retrieved 11 September 2009. ^ "AWA Superstars of Wrestling World Women's Title". Wrestling-Titles. Retrieved 8 June 2009. ^ Dunn, JD (11 April 2008). "Dark Pegasus Video Review: Shimmer Vol. 5". 411Mania. Retrieved 9 January 2011. ^ Dykens, Brad. "SHIMMER Volume #14". Online World of Wrestling. Retrieved 9 January 2011. ^ Radican, Sean (31 May 2008). "Shimmer Vol. 15 (Haze vs. Stock, Del Rey vs. Kong)". PWTorch. Retrieved 9 January 2011. ^ "Shimmer Women Athletes results". Shimmer Women Athletes. Blogspot. Retrieved 9 January 2011. ^ Sean, Radican (12 November 2009). "Shimmer Vol. 23 Review - Busic-Melissa, Kong-Martinez, MsChif-Deeb". PWTorch. Retrieved 9 January 2011. ^ Campbell, Mike (12 September 2009). "Shimmer: Volume 24 - Taped 5.02.09". 411Mania. Retrieved 9 January 2011. ^ Csonka, Larry (5 May 2009). "Advertisement Shimmer Volumes 25 and 26 Results". 411Mania. Retrieved 10 January 2011. ^ a b Csonka, Larry (9 November 2009). "Shimmer Vol. 27 and 28 DVD Taping Results". 411Mania. Retrieved 9 November 2009. ^ Dykens, Brad (7 April 2007). "Shimmer Volume #9". Online World of Wrestling. Retrieved 10 January 2011. ^ Garoon, Brad (6 September 2007). "BG Says: Shimmer Women Athletes - Volume 9". 411Mania. Retrieved 10 January 2011. ^ Cook, Steve (12 September 2010). "Shimmer Volume 35 Taping Results". 411Mania. Retrieved 10 January 2011. ^ JSIN (16 September 2007). "9/15 ROH in Chicago Ridge, Ill: Complete PPV taping results (Briscoes vs. Steen & Generico Ladder match)". Pro Wrestling Torch. Retrieved 19 December 2010. ^ Gifford, Nick (2010-05-09). "5/8 ROH in New York City: Tyler Black ROH Title defense, TNA's Machine Guns challenge for ROH tag titles, Daniels, Awesome Kong". Pro Wrestling Torch. Retrieved 2010-12-19. ^ MCC (2010-07-24). "7/23 ROH results in St. Louis: Briscoes & Kong vs. ROH tag champs, Generico vs. Steen, Strong vs. Cabana". Pro Wrestling Torch. Retrieved 2010-12-19. ^ Mifsud, Brandon (25 July 2010). "7/24 ROH Results: Chicago Ridge, Illinois". WrestleView. Archived from the original on 2 October 2012. Retrieved 19 December 2010. ^ Caldwell, James (18 December 2010). "Caldwell's Ring of Honor PPV report 12/18: Ongoing "virtual time" coverage of "Final Battle 2010" - Strong vs. Richards, Generico vs. Steen". Pro Wrestling Torch. Retrieved 19 December 2010. ^ "NWA No Limits 3rd Anniversary card" (in German). Cage Match. Retrieved 2009-02-02. ^ Csonka, Larry (6 May 2008). "TNA News: Survivor's Anderson, LAX Push, Kong and More". 411mania. Retrieved 2 February 2009. ^ Goodman, Larry. "Thorns & Roses results". National Wrestling Alliance. Archived from the original on 2011-07-14. Retrieved 1 April 2009. ^ "Results - 2007". Celtic Wrestling. Retrieved 10 January 2011. ^ "RQW Results 16th June". Real Quality Wrestling]. Archived from the original on 29 June 2007. Retrieved 8 June 2008. ^ a b "ChickFight 9 Quick Results from UK". ChickFight. 17 June 2007. Archived from the original on 3 June 2009. Retrieved 3 January 2010. ^ a b "WSU results". Online World of Wrestling. Retrieved 11 January 2011. ^ Sokol, Chris (15 October 2007). "Angle gets stung at Bound For Glory". SLAM! Wrestling. Retrieved 3 January 2010. ^ Sokol, Chris (3 December 2007). "Chaos rules at Turning Point". SLAM! Wrestling. Retrieved 3 January 2010. ^ Sokol, Chris (18 April 2008). "TNA Lockdown: Joe captures gold". SLAM! Wrestling. Retrieved 3 January 2010. ^ Oliver, Greg (9 July 2009). "Taylor Wilde". SLAM! Wrestling. Retrieved 4 January 2010. ^ Kapur, Bob (18 July 2008). "Main event mars Victory Road". SLAM! Wrestling. Retrieved 4 January 2010. ^ Sokol, Chris (7 November 2008). "Impact: Steiner tops Joe going into Turning Point". SLAM! Wrestling. Retrieved 4 January 2010. ^ Sokol, Bryan and Chris (30 January 2009). "Impact: Main Event Mafia's in charge". SLAM! Wrestling. Retrieved 4 January 2010. ^ Sokol, Bryan and Chris (14 November 2008). "Turning Point: Mafia gains momentum". SLAM! Wrestling. Retrieved 14 January 2010. ^ Sokol, Bryan and Chris (20 February 2009). "Impact: Mafia Melee". SLAM! Wrestling. Retrieved 4 January 2010. ^ Sokol, Bryan and Chris (27 February 2009). "Impact: The Mafia gets stung". SLAM! Wrestling. Retrieved 4 January 2010. ^ Sokol, Bryan and Chris (9 April 2009). "The TNA Destination X disaster". SLAM! Wrestling. Retrieved 4 January 2010. ^ Sokol, Bryan and Chris (27 March 2009). "Impact: Captain Joe". SLAM! Wrestling. Retrieved 14 January 2010. ^ Sokol, Bryan (20 April 2009). "TNA's lackluster Lockdown". Slam! Sports. Canadian Online Explorer. Retrieved 14 January 2011. ^ Keller, Wade (28 August 2009). "Keller's TNA Impact report 8/27: Results, star ratings, thoughts, observations, nitpicks, quotebook". PWTorch.com. Retrieved 5 January 2010. ^ Sokol, Chris; Bryan Sokol (2009-09-18). "Impact: Angle steps ahead of Morgan". SLAM! Sports: Wrestling. Canadian Online Explorer. Retrieved 2010-01-05. ^ Tylwalk, Nick (22 October 2009). "Sting loses but doesn't retire, capping off night of ups and downs at Bound for Glory". SLAM! Wrestling. Retrieved 4 January 2010. ^ Tylwalk, Nick (21 November 2009). "Two superb matches highlight surprisingly straightforward Turning Point". SLAM! Wrestling. Retrieved 4 January 2010. ^ Boutwell, Josh (18 December 2009). "Impact Results - 12/17/09". WrestleView. Retrieved 1 January 2010. ^ a b Tylwalk, Nick (5 January 2010). "Impact: Hogan and friends arrive, but Angle and Styles steal the show". SLAM! Wrestling. Retrieved 5 January 2010. ^ "Kong sent home by TNA after fight last night". Wrestling Observer. 19 January 2010. Retrieved 19 January 2010. ^ Gerweck, Steve (21 January 2010). "TNA Knockout gives notice". Wrestling Observer. WrestleView. Archived from the original on 2 October 2012. Retrieved 22 January 2010. ^ Martin, Adam (12 February 2010). "Report: TNA suspends a Knockout". WrestleView. Archived from the original on 2 October 2012. Retrieved 13 February 2010. ^ Brown, Karina (25 February 2010). "Wrestler Accuses 'Love Sponge' of Hate Call". Courthouse News Service. Archived from the original on 28 February 2010. Retrieved 26 February 2010. ^ Gerweck, Steve (2 March 2010). "TNA Knockout done with TNA?". WrestleView. Archived from the original on 2 October 2012. Retrieved 1 March 2010. ^ Keller, Wade (8 March 2010). "TNA Impact Results 3/8: Keller's live ongoing report covering the historic beginning of Monday Night War II". PWTorch. Retrieved 9 March 2010. ^ Martin, Adam (16 February 2010). "Spoilers: 2/15 TNA Impact tapings". WrestleView. Archived from the original on 2 October 2012. Retrieved 9 March 2010. ^ "A Statement Regarding Awesome Kong". Total Nonstop Action Wrestling. Archived from the original on 25 March 2010. Retrieved 22 March 2010. ^ Caldwell, James (30 April 2010). "TNA News: Awesome Kong interview - why she left TNA, pay discrepancy, unhappy with changes; talks Bubba, ROH, WWE". Pro Wrestling Torch. Retrieved 3 May 2010. ^ Meltzer, Dave (10 March 2013). "Sun. update: TNA Lockdown preview, Roode update, WWE movie update, Mania update, Sammartino, Jericho, Rousey, Punk, Retiring young". Wrestling Observer Newsletter. Retrieved 11 March 2013. ^ Caldwell, James (29 December 2010). "TNA News: Sources say former TNA Knockouts champion Awesome Kong has signed with WWE". Pro Wrestling Torch. Retrieved 29 December 2010. ^ "WWE Signing is official". Wrestling Observer Newsletter. 1 January 2011. Retrieved 1 January 2011. ^ Caldwell, James (11 April 2011). "Caldwell's WWE Raw results 4/11: Ongoing "virtual time" coverage of live Raw - Gauntlet match, Edge "retirement" tease, Ross back on TV". Pro Wrestling Torch. Retrieved 11 April 2011. ^ Caldwell, James (1 May 2011). "Caldwell's WWE Extreme Rules PPV results 5/1: Ongoing "virtual time" coverage of live PPV - Cage, Ladder, Falls Count Anywhere, Last Man Standing, Loser Leaves Town, Country Whipping matches". Pro Wrestling Torch. Retrieved 1 May 2011. ^ Plummer, Dale (2 May 2011). "Raw: Happy Birthday Rock". Slam! Sports. Canadian Online Explorer. Retrieved 3 May 2011. ^ Parks, Greg (6 May 2011). "Parks' WWE SmackDown report 5/6: Ongoing "virtual time" coverage of the show, including Christian's Championship Celebration". Pro Wrestling Torch. Retrieved 6 May 2011. ^ Caldwell, James (23 May 2011). "Caldwell's WWE Raw results 5/23: Complete "virtual time" coverage of live Raw - Over the Limit PPV fall-out, Bret Hart, Savage tribute". Pro Wrestling Torch. Retrieved 24 May 2011. ^ Caldwell, James (30 May 2011). "Caldwell's WWE Raw results 5/30: Complete "virtual time" coverage of live Raw - Cena vs. Truth main event, Kharma speaks". Pro Wrestling Torch. Retrieved 31 May 2011. ^ "Alicia Fox and Kharma's "WWE '12" Characters Officially Unveiled". Diva-Dirt. Retrieved 14 December 2011. ^ "WWE '13 Roster". THQ.com. Archived from the original on 19 August 2012. ^ "Kharma on Her WWE Status: "All Parties Are in Gorilla"". Diva Dirt. Retrieved 2013-09-25. ^ "Former WWE Diva makes return to ring this weekend on iPPV". Prowrestling.net. 2012-11-14. Retrieved 2017-08-25. ^ a b "Show results - 1/18 Resistance Pro in Chicago: Kong captures Women's Title, TNA Gut Check winner, Hardy in main event". Pro Wrestling Torch. 21 January 2013. Retrieved 22 January 2013. ^ "Past results". Chikara. Archived from the original on 2013-10-17. Retrieved 2013-03-09. ^ 因縁再燃…奈七永にＷコングが宣戦布告. Tokyo Sports (in Japanese). 2015-08-27. Retrieved 2015-08-27. ^ Caldwell, James (2015-11-22). "Report – Awesome Kong retiring". Pro Wrestling Torch. Retrieved 2015-11-23. ^ "Kharma — I'm Not Retiring From Wrestling Yet … Despite Reports". Pro Wrestling Sheet. Retrieved 2015-11-24. ^ 7･18　アジャコング30周年記年興行　後楽園ホール大会　アジャコング＆アメージング・コング＆浜田文子vs松本浩代＆山下りな＆橋本千紘. Battle News (in Japanese). 2016-07-18. Retrieved 2016-07-18. ^ Boutwell, Josh (March 6, 2015). "TNA Impact Wrestling Results - 3/6/14 (Roode vs. Richards)". WrestleView. Retrieved April 26, 2015. ^ James, Bobby (May 8, 2015). "TNA Impact Wrestling Results - 5/8/15 (Bully Ray Returns)". WrestleView. Retrieved May 9, 2015. ^ "IMPACT Results: Bell To Bell World Title Match Set, New Knockouts Contenders and More!". June 17, 2015. Archived from the original on June 20, 2015. Retrieved June 20, 2015. ^ James, Bobby (August 12, 2015). "TNA Impact Wrestling Results - 8/12/15 (TNA vs. GFW)". WrestleView. Retrieved August 13, 2015. ^ McMahon, Mike (January 5, 2016). "1/5 TNA Impact – McMahon's Complete Report on Pop debut". Pro Wrestling Torch. Retrieved January 5, 2016. ^ Johnson, Mike (February 5, 2016). "Awesome Kong-TNA Update". PWInsider. Retrieved February 5, 2016. ^ "TNA Impact Wrestling Releases Awesome Kong". Total Nonstop Action Wrestling. February 5, 2016. Retrieved February 5, 2016. ^ "Katy Perry drops video for alleged Taylor Swift diss track Swish Swish | Metro News". Metro.co.uk. Retrieved 2017-08-25. ^ "Episode 825 - Kia Stevens / Chavo Guerrero Jr. â€" WTF with Marc Maron Podcast". Wtfpod.com. 2017-07-03. Retrieved 2017-08-25. ^ Caldwell, James (30 May 2011). "WWE News: Kharma announces pregnancy on Raw, written off TV, references Jim Ross, Ross responds". Pro Wrestling Torch. Retrieved 31 May 2011. ^ "WWE Diva Kharma -- I Dropped a Few Pounds ... Out of My Uterus". TMZ.com. 31 January 2012. ^ Caldwell, James (31 January 2012). "Why Kharma was able to return in the Rumble". Pro Wrestling Torch. Retrieved 24 February 2012. ^ "Former WWE Star Kharma -- I Don't Wanna Be Fat Anymore". TMZ.com. 6 August 2012. ^ "Wrestling supercards and tournaments". Pro Wrestling History. Retrieved 9 January 2011. ^ "And the 2011 nominees are..." Cauliflower Alley Club. 3 September 2010. Archived from the original on 9 March 2011. Retrieved 21 April 2011. ^ "Oz Academy Results: 1998~2005". Purolove (in German). Retrieved 6 April 2013. ^ "The PWI Female 50 Rankings: Who Is The Top Women's Wrestler In The World?". PWPix.net. 19 September 2008. Retrieved 19 September 2008. ^ "Kia Stevens profile". Sherdog. Retrieved 2013-11-18. Wikimedia Commons has media related to Awesome Kong.